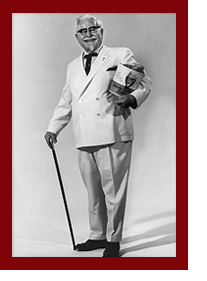 [Texas state] Rep. Ken Legler on Monday arrived on the House floor wearing a cream white suit, string tie and carrying a cane and a KFC bucket of chicken. He walked through the lower chamber doors greeted with a robust, "Please welcome Colonel Sanders." Legler said he was dressed as Colonel Sanders to "liven things up" on what was the last day of the legislative session. We last saw Colonel Sanders (who was of course from Kentucky, not Texas) in the United Nations General Assembly in 2009, seeking statehood for what he called the "Grilled Nation" of KFC fans. He hadn't been invited there, either.